Keepers at ZSL London Zoo welcomed a new arrival earlier this week – a critically endangered Sumatran tiger named Asim. 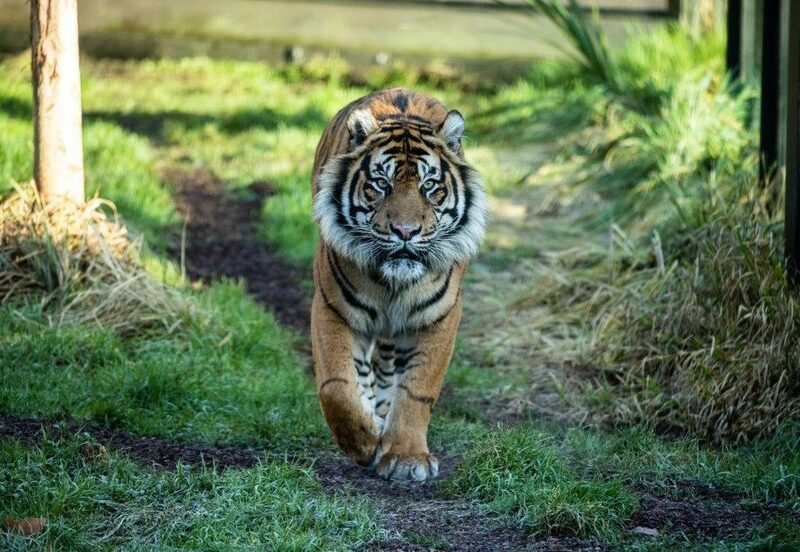 The seven year old male was moved from Ree Park Safari in Denmark as a new mate for resident female, ten-year-old Melati, as part of the European Endangered Species Programme (EEP) for Sumatran tigers. ZSL London Zoo’s head tiger keeper Kathryn Sanders said: “Asim arrived Tuesday after catching the ferry from France and immediately made himself at home in his new, cosy den. “He got up bright and early this morning and got to work exploring his territory – we’ve spotted him lounging on his heated rocks and even dipping his paws in his new swimming pool. “In the wild, the male always approaches the female’s habitat when looking for a mate: at the moment Asim and Melati can see and smell each other from their separate paddocks – it’s important to let Asim get to know his new surroundings before we formally introduce them.